Chocolate and Orange Cupcakes with Sugar and Crumbs Toasted Marshmallow buttercream and marshmallow topping. Mix all ingredients in mixer until combined. Then, bake 15/20 min on 170 deg. Make buttercream as on back of packet. Cut marshmallows in half diagonally, this makes the petals. Spread a thick layer of cream over cake tops. Starting on outside Edge working to centre push petals into cream to secure. You can leave a space at centre and put in contrasting coloured balls or go right to centre with petals. 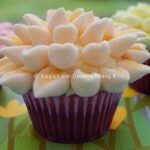 The petals can be coloured using coloured sugar. To Make this put some sugar in a zip bag and add some colour splash, shake the bag and gentlymassage until evenly coloured throw cut marshmallows into bag and give a good shake. 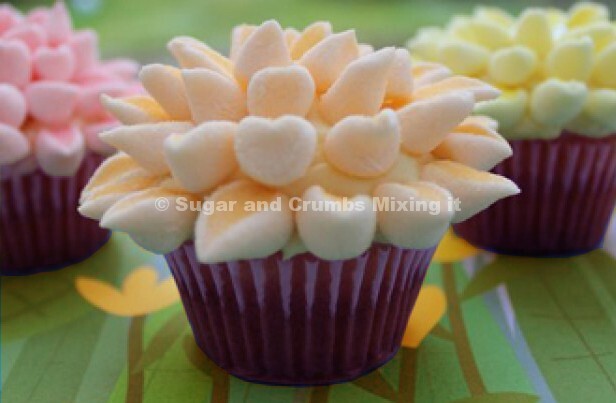 The sticky cut side of mallows will pick up the coloured sugar leaving the rest clean.